Bishop Nulty to launch €4m development in Kildare including Solas Bhride centre and three hermitages: Faith, Hope and Love. A double celebration will honour St Brigid on her feast day as a new centre and hermitages in Kildare are officially opened in the coming weeks. The sod turning ceremony for Solas Bhride Centre and Hermitages was held in February 2013. However, they had been planned well before that and the business plan was in fact launched in 2011. It set out the agenda for the fundraising project aimed at generating over €4 million. Of the long journey to bring that plan to reality, the Brigidine Sisters said it was a faith journey which often made them wonder if they would have set off on had they known the challenges that lay ahead. The planning process, building, financing and fundraising were all part of the journey. A statue by the renowned Canadian sculptor, Timothy Schmalz, spent longer than expected on the high seas. The connection of traffic lights, to facilitate the subsequent opening of the centre, was also delayed. The Sisters say this was ironic given that the centre name Solas Bhride meaning “light/flame of Brigid”. But finally as the feast day of their Saint edges closer they are excited at the prospect of welcoming many pilgrims and visitors. “We are so delighted, so happy and so grateful for this, so blessed because it is such a beautiful place for the unfolding of the legacy of Brigid in Kildare,” Sr Mary Minehan of the Brigidines told CatholicIreland.net. A wide range of spiritual exercises will be available at the centre ranging from the story of Brigid presented in creative and life-giving ways to pilgrimages to St Brigid’s Well, Cathedral and the Curragh plains. “We have three little hermitages Faith, Hope and Love, we have it in Irish – Creideamh, Dóchas agus Grá,” said Sr Mary Mineahn. These are self catering and guests can opt in or out of spiritual exercises. “It depends on the needs of the people who come, some might just want to have some quiet time to nourish themselves,” said Sr Mary Minehan. She explained that there meeting rooms within the centre and a reflective walk around the grounds which contain a labyrinth. The official opening of the centre will take place on 30 January with Bishop Denis Nulty of Kildare and Leighlin and Eurovision winner, Eimear Quinn, who was present at the launch of the initial business plan for the centre. Back then she spoke about the inspiration St Brigid has been for her in her life. She performed a chant written by Hildegard of Bingen. 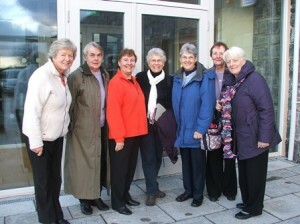 Maevh Ni Uallachain, ssl, Thomasina Murphy, csb, Mary Minehan, csb, Joyce and Margaret, Servite Sisters, Rita Minehan and Mary Hiney csb. The official opening will take place at the start of this year’s annual Feile Bride festival. It runs until 8 February and its theme is Light: A New Awakening. 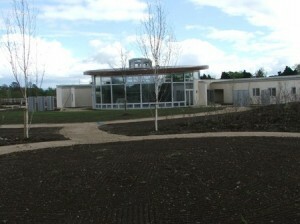 The centre will be a hive of activity as many of the ‘feile’ events will be held there. Other events will be held in venues around Kildare town and at the famous St Brigid’s Well. For example the opening Brigid’s Eve Ritual (31 January) will be held at the well with quiet reflection, song and prayer to celebrate on the eve of springtime. Participants are urged to bring a light or lantern and suitable clothing and footwear for this outdoor evening event. Talks and speakers range from: Brigid, Bees and Brewing by the Boyle sisters in Kildare town, to the Annual Celtic Heritage Lecture The Unfolding Universe – Glimpses into Mystery with Nellie McLoghlin rsm, to the Afri Justice and Peace Conference at Solas Bhride. The week of talks, walks, prayer, music and poetry will end with on Sunday 8th February with a morning open air mass at St. Brigid’s Well.